Smile Broadly with Fiber-Reinforced Composite Bridges. Posted 23.09.2016 at 08:09 in blog by admin / Comments Off on Smile Broadly with Fiber-Reinforced Composite Bridges. Missing front teeth pose serious cosmetic concerns especially in teenagers, young adults, females and working individuals who deal with people during daily jobs. Empty spaces ruin your smiles resulting in loss of confidence and self-esteem during interaction of people in your office and presentations in the university class rooms. Call Albuquerque New Mexico Dental for composite ridges. Loss of front teeth is a disastrous event for the affected individuals and an immediate replacement is extremely important for the provision of a positive psychological approach and maintenance of facial esthetics, smile and phonetics. Removable dentures were common in practice in the past for the replacement of missing and lost natural teeth. How Albuquerque New Mexico Dental Can Help? These removable artificial teeth are not comfortable to wear. They fracture and often dislodge from patient’s mouth during eating, speaking and every day activities. Furthermore,you can brush regularly and keep in water before sleeping at night. New innovative fixed teeth replacement devices have replaced these removable artificial teeth prosthesis. Albuquerque New Mexico 24 hours emergency specialist cosmetic & restorative dentist Dr William C Gardner at NM Family and Cosmetic Dentistry PC offers state of the art and conservative fiber-reinforced composite bridge restorations for the fixed replacement of your missing teeth. Q. WHAT ARE DENTAL BRIDGES? WHICH ARE THE DESIREABLE REQUIREMENTS WHILE CONSIDERING REPLACEMENT OF MISSING TEETH? A. Dental bridges are fixed dental tooth replacement prosthesis which involves adjacent teeth for the support and stability of artificial tooth. Dental crowns are placed on the adjacent teeth which are connected with the artificial tooth in the centre. Conventional dental bridges require removal of sufficient natural enamel tooth tissue from adjacent teeth for adequate support and strength for bearing chewing and mastication forces in future. Q. WHAT ARE THE DEMERITS OF CONVENTIONAL DENTAL BRDIGES? • Can be fractured or chipped off in people with night grinding. Q. WHAT ARE FIBER-REINFORCED BRIDGES? A. It is minimally invasive and extremely cost-effective. This unit which employs glass fiber strands or bundles in order to create fiber framework for replacing lost natural teeth. Specifically oriented high strength fibers incorporated within the resin matrix for improving the mechanical properties of these composites. Thus, for more information get in touch with Albuquerque New Mexico Dental office now. Q. 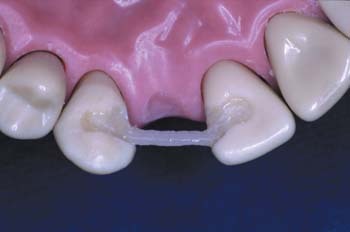 WHAT ARE THE IDEAL SITUATIONS FOR THE PROVISION OF FIBER-REINFORCED BRIDGES IN YOUR MOUTH? • As fixed retainer device after braces treatments. Q. HOW ARE THESE BETTER AS COMPARED TO CONVENTIONAL BRIDGES? • No associated pain or discomfor, so quite popular. • Long term success rates especially in front area of your mouth. Do you have cosmetic defects in your teeth? Is it making your smile less pleasant? Is this owing to decayed, missing, crowded, crooked, mal-aligned or mal-posed teeth? You can visit your 24 hours emergency Albuquerque New Mexico dentist Dr William C Gardner. Book an appointment at NM Family and Cosmetic Dentistry PC. He is available throughout day and night. He focuses upon best solution for improving your dental and oral health conditions.